SMRT is a positional release modality that interrupts pain signals in the body, works quickly and painlessly, has an incredibly calming effect on the nervous system, and is highly stimulating to the lymphatic system. Spontaneous Muscle Release Technique • NCBTMB-Approved Continuing Education • Addresses structures beyond muscles including: ligaments, tendons, and fascia. • Resets the neutral point between muscle spindle cells and golgi tendon organs. • Releases trigger points painlessly. • Enhances all other modalities. 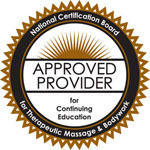 Approved NCBMTB Continuing Ed Credits "approved provider #451541"
Full Circle is approved by the National Certification Board for Therapeutic Massage and Bodywork (NCBTMB) as a continuing education approved provider. Additionally, each course offered by Full Circle is approved for state continuing education, where appropriate. These two processes ensure that Full Circle's continuing education courses are rigorously vetted for quality standards. Our 600-hour basic massage therapy program prepares you to pass the MBLEx in order to become a licensed massage therapist. Full Circle School's 600-hour Basic Massage Therapy Program is taught by massage therapists with over 10 years experience each. We will teach you to do many types of bodywork so you can design your massage therapy career to suit your needs. In your third level massage course within this program you will be taught SMRT (Spontaneous Muscle Release Technique), a course you cannot get anywhere but Full Circle School. Please click the button above to view our catalog, pricing, and schedule for this program and, when you are ready, call us to set up an interview and tour at 720-667-4958 or email contactfullcircleschool@gmail.com. Book your travel through Full Circle! 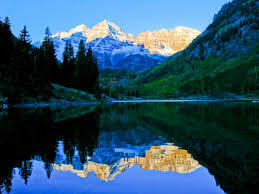 Book your travel through Full Circle. Use our new travel agency through My Vortex to save on travel expenses all over the country.